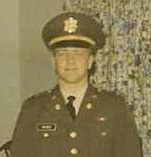 John Robert Holmes came to be an officer via Junior ROTC at Staunton Military Academy, Staunton, VA. and ROTC at Purdue University, W. Lafayette, IN. He reported for duty in the U.S. Army Transportation Corps at Ft. Eustis, VA in July 1967. After training he served in Army Aircraft Maintenance at Fliegerhorst Kaserne, Hanau, W. Germany for 14 1/2 months. Following additional training at Ft. Eustis John served with the 34th General Support Group, Army Aircraft Maintenance, in Quin Nhon and Tan Son Nhut Air Base, South Vietnam. While there he was awarded the Bronze Star for Meritorious Service. He was released from service in Oakland, CA in July 1970.